In May 1992, the local sisterhood Epsilon Kappa Theta was born. EKT split from its national sorority, Kappa Alpha Theta, after several years of internal struggle and disagreement. The national organization celebrated the Epsilon Kappa colony when it was founded in 1982, but relations between the two had soured by 1984, according to EKT’s website. “The membership at the time felt that we were paying a lot of money to the national organization and didn’t feel that we were getting much in return,” said Karen Febeo ’93, the president first of the Epsilon Kappa colony of KAT and later the first president of EKT. “The national organization didn’t seem to be aligned with the values of coeducation that we experienced at Dartmouth,” she added. Shortly thereafter, the sisters of the Epsilon Kappa colony began to openly discuss disaffiliating themselves from the national sorority and, on May 4, 1992, in a unanimous vote, they decided to become a local sorority. The decision to separate came mere weeks before Commencement, and, Febeo said, “a handful” of sisters opted to remain members of KAT. The bulk of the sisters, about 100 at the time, joined the new EKT. EKT took its name from its chapter name, adding the “Theta” from KAT’s name so that the sisters could still be known that way on campus. “I don’t remember dissension — I do remember discussion,” Febeo said of the process. She said that while the national sorority was not necessarily pleased to lose a chapter, there was no bad blood between the two groups, although she said that she could not recall the specifics of the incident. A representative from KAT said that none of the group’s current leaders were familiar with the events of 1992, and that records involved were not publicly available. Febeo said that both the College and other sororities supported EKT’s decision. “I don’t recall any negative repercussions at all,” Febeo said. The College also contributed to EKT’s new house at 15 Webster Ave. shortly after the sorority localized, Febeo said, providing a loan to the sorority so its sisters could oversee the refurnishing and redecorating of the space. “It provided a place where we could host social events in our own space, which would potentially make some sisters more comfortable,” Febeo said. The College aided the new sorority in creating its first constitution and set of bylaws, Febeo said. She said that she thought, in hindsight, that localizing the sorority was a positive step. EKT is the second youngest of Dartmouth’s three local sororities, and the last to disassociate from a national group. Sigma Delta sorority, formerly a chapter of the national Sigma Kappa sorority, separated from its national organization in 1988, 11 years after its founding. Kappa Delta Epsilon was created in the fall of 1993 after the local sorority Xi Kappa Chi dissolved earlier that year. 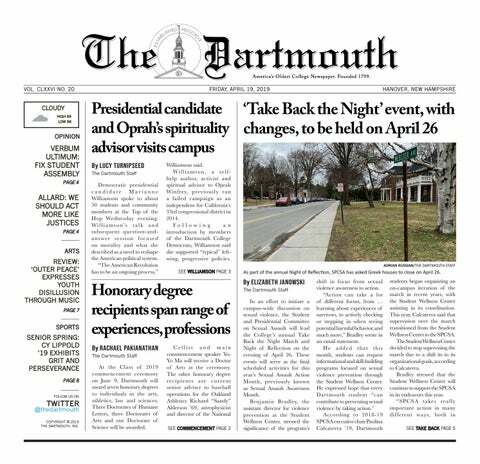 A report prepared for the “Moving Dartmouth Forward” presidential steering committee noted that the most common suggestion among 250 ideas submitted by more than 500 students was to make all sororities local. Thirty-six submissions recommended the measure, with many focusing on the potential to move parties into female-dominated social spaces. Reeves declined to comment further.